Pivoting is perhaps the most over-used term in ski instruction. It means pretty much anything, depending on who is using it and what context it is being used in. At the core, the notion of pivoting the skis refers to an active rotation of the feet, around their own vertical axis, generally resulting in a skidding of the skis, when flat on snow. The notion of carving is normally contrasted with pivoting as well as skidding and steering, which are also related. We prefer to use the general notion of Oversteering, which is a superset or making the skis turn shorter than otherwise. There are many ways to make a ski turn more than when they're carving. Some of these are good and some have negative consequences, especially around biomechanics and angular momentum, so rather than bundling everything related to the ski rotations into a single and blunt concept like pivoting, we prefer to refer to specific mechanisms, as needed. See Oversteering for a detailed discussion. Note that some refer to pivoting as the simple rotation of the feet, without regard to it being active (turning the skis) or passive (following a turning ski) and there is often confusion between separation and pivoting, see Steering and coiling. Sometimes a fuzzy instruction like "pivot from the center of the ski" may cause some skiers to get more forward (as opposed to being told to use the ankles and get shin pressure). Often, instructing someone that is pivoting to get less "skidding" and more "slicing" action produces good results, as a sort of an external cue. For some, pivoting even includes carving, since the skis are in fact turning relative to their vertical axis. 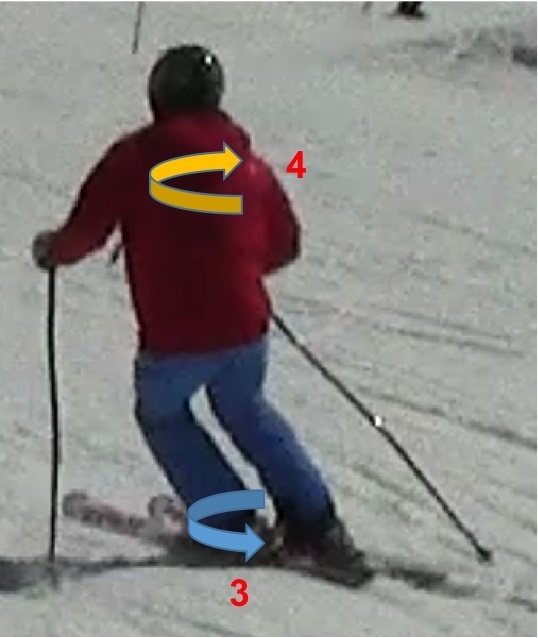 For most though, any idea of pivoting implies skidding and twisting the skis when flat on snow and no form of carving. So, is pivoting an input, a movement or is it a result, an outcome? In general, forceful rotations are generally not effective and with sidecut skis not necessary. A forceful rotation of the feet is also more dangerous, because it's easy to catch the wrong edge at small angles, resulting in a fall. Putting a shaped ski on edge will initiate a rotation of the ski instantly, carved or not. This however is not triggered by a rotational "input" but is the result of putting the ski on edge and simply standing on it - it does not make sense to call this pivoting. Whether the skis turns as a result of its sidecut and edge angle (carving) or is oversteered is a different aspect. When the skis are no longer flat on snow, a rotation of the feet would either dig the tails or the tips more into the snow, since a smaller component of it would be directed laterally (horizontally) to the snow. At this point, to make the skis pivot around their axis, or steer them or basically redirecting them faster than pure carving would allow, very different actions and movements of the body are required (moving pressure aft etc). Pivoting movements result in skidding, but skidding is not always a result of pivoting. Simply edging the skis less than what it would take to hold an edge at a given amount of pressure, will cause skidding. Skidding that is a result of pivoting is usually less controllable than skidding that is a result of other techniques (see Oversteering). Some relate the notion of pivoting to separation, in the sense that if the feet are pivoting, that should create separation from the upper body, implying the upper body should rotate less or at all or even the other way. On the other hand, to have separation, while the skis turn left, the upper body stays still via an internal effort to separate and the only levers we have are the boots, so there is a rotational component at the feet to stabilize the upper body. Many however confuse the two, whether this is a separate effort to stabilize the upper body, i.e. counteraction or is it a component of a pivoting effort to turn the skis. We prefer the notion of Coiling. It transmits the right image of torsion because the two ends rotate in different ways and also does not lock this concept onto "pivoting" as in forceful skidding nor any angles or axis that the skis may be edged at. Lately, some schools of thought started moving away from pivoting and using Steering more and more1, with a somewhat overlapping meaning. Some think every turn must start with a pivoting movement (as input) and continued with edging2. A purely carved turn would have a lesser pivoted element. Our experience and line of thinking goes directly against this last principle: the default turn should not have a pivoting element, see What is the effective technique. The skis are certainly skidded and perhaps pivoted when we deal with terrain and conditions that we can't carve safely: steeps, powder etc. Pivoting is easy, it's the easy way to get the skis pointed wherever we want to point them, which is why, in order to improve our skiing, we must learn to use the skis and the ski design more. To improve, we should strive to use pivoting as little as possible. In racing, pivoting is generally avoided at the high levels. It is used in the form of the stivot sometimes on steep courses or as redirection++ when the racer is late and can't make a gate, but the go to technique in racing is "a clean edge" or arc-to-arc. At the top of a high performance turn, when the skis are very lightly in contact with or often off the snow, redirection of the skis is easy, due to the extreme movements of legs and body, even with no rotational input, creating the impression of the skis having been pivoted. As we go down the skill ladder in the racing world, pivoting efforts are used more and more, as racers have trouble carving the courses - see Training the ideal line and An honest talk about pivoting and ski racing. There are many ways that the skis can redirect as a result of other movements, i.e. change direction without a pivoting or carving action and these are often misinterpreted as pivoting. For instance tipping the skis while in the air and pulling the feet back may result in a redirection of the skis, as the heels move out more than the toes. Viewed 1587 times ( | Print ) this page.